With kids returning school, many moms are welcoming a little “me time” that includes opportunity for some spiritual uplift. Here are a few selections that busy moms can read in those brief pauses that are few and far between at this stage of life. From Covenant Communications comes a lovely, padded bound book of 100 Favorite Verses for Women, by Shauna Kaye Humphreys (2013, 200 pages, $19.99). The author — a grandmother, college writing instructor, and former early-morning seminary teacher — illuminates each scripture selected from the LDS Standard Works with just two pages of thoughts and examples. Additional insight comes from a related scripture or a quote from a General Authority. It’s a deceptively simple format that invites readers to “perceive with new eyes the words Christ spoke to all.” Women, and mothers in particular, will appreciate a deeper understanding of the Savior’s concern for God’s daughters. Although two pages can be read in a relatively short space of time, readers will find much to ponder in 100 Favorite Verses for Women. 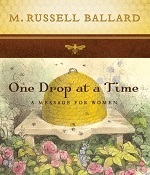 Elder M. Russell Ballard offers encouragement in One Drop at a Time: A Message for Women, adapted from his talk in October 2012 General Conference, “Be Anxiously Engaged.” Drawing on the time when his father owned a peach orchard and kept beehives to enhance the production of fruit, he explains that honey contains all the substances necessary to sustain mortal life. Another uplifting read is The Mother’s Mite, by DeAnne Flynn, mother of seven, popular speaker and presenter, and blogger at MothersMite.com. “Mothering is a very big deal,” she asserts in the introduction to this slick-paged little volume perfect for a quick psychological pick-me-up. She then proceeds to share experiences — hers and other moms’ — in quick-read accounts that underscore that fact. The pages include briefly stated suggestions and ideas, black-and-white photos, and an occasional recipe. With humor and the wisdom of age, Flynn helps readers remember that small, daily efforts do matter to the big picture (Deseret Book 2011, 146 pages in soft cover, $18.99).